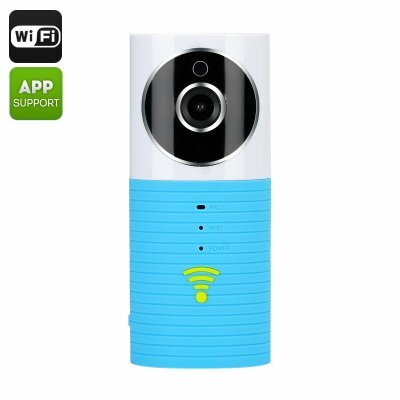 Successfully Added Wi-Fi Baby Monitor 'Teddy Bear' - 1/3 Inch CMOS Sensor, Motion Detection, Night Vision, SD Card Recording, Dual Way Audio to your Shopping Cart. This cute little IP cam is perfect for keeping an eye on those who matter the most. Disguised as a nice toy, it can simply sit on your child’s night stand and act as a reliable security gadget. This small teddy bear may not look like a powerful security gadget, but that’s exactly what it is. Coming with a 1/3 inch CMOS sensor and featuring 1280x720 resolution, it will provide you with stable video feedback from you child’s room. It also comes with two-way audio, so you can easily communicate and check on your kid any time, even from afar. That’s right, the cam comes with Android and iOS apps for remote monitoring. The 'Teddy Bear' IP camera comes with 4 built-in IR LEDs and is able to offer clear video and images even after dark with its 10 meter night vision. So, you will be able to keep an eye on your loved ones even after dark. Motion detection will alert you if there is any suspicious activity and record these events onto an SD card - up to 64GB. Moreover, the IP camera will use H.264 compression to make sure that the storage space is use efficiently. Small and portable, the cam can be easily moved around the house and you can even bring it along on vacation. Ready to use right out of the box, the cam comes with everything you need for a quick setup. Wi-Fi IP Camera 'Teddy Bear' comes with a 12 months warranty. Brought to you by the leader in electronic devices as well as wholesale IP cameras and baby monitors..